I love mixed media. 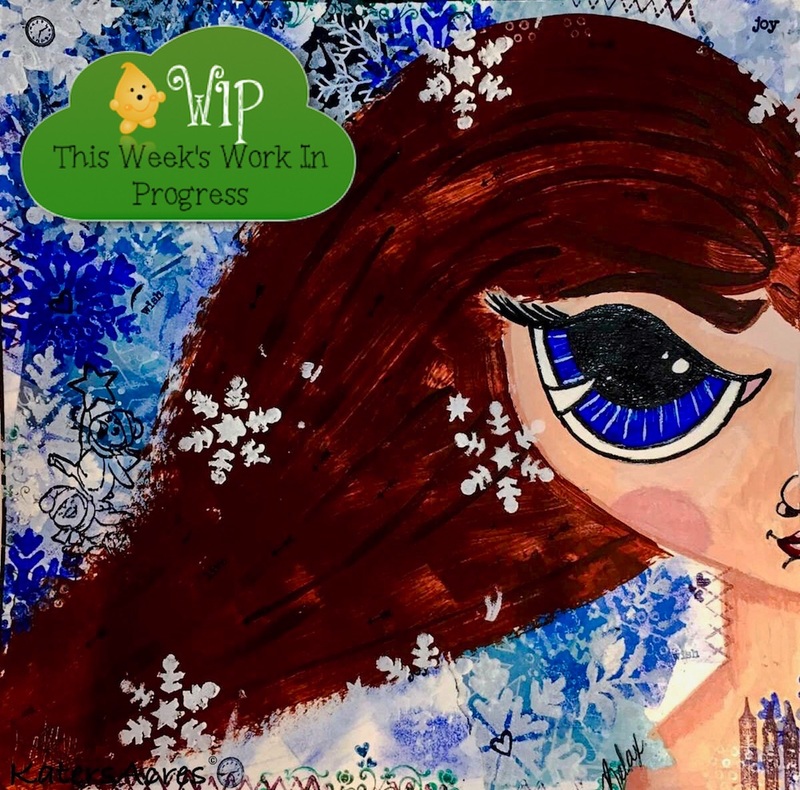 Especially mixed media that centers around paper, paint, and collaged elements; like this Winter Art Girl. There’s just something about collage that I have always been drawn to and always enjoyed. Today’s WIP Wednesday is about taking a break from your “main art form” to express yourself and your heart through another art medium. Come on over and join me to see my Winter Wonderland Snow Girl. I made this as a dashboard for my Traveler’s Notebook. As a bonus today I’ll teach you to make your own. Today’s post is a little non-clay related, but I think sometimes it benefits us to take a break from our top art form and dabble in another. Why? Because it hones our artistic skills, eye, and our passion for our main art form. My goal in today’s post is to inspire you to try something new, maybe even something like what I’ve done with this winter art girl! I want you to leave your thoughts in the comments below … do you want to see more of what goes on in my studio, even the non-clay related stuff? Fresh out of the hospital just after Christmas and not having much endurance yet to complete any clay projects, I had the itch to make art in some form. I had several drawings I had managed to sketch while sitting in a hospital bed. One of which was this vibrant little girl. I had drawn her within the perimeters of the size of a Midori Traveler’s Notebook. At the time I wasn’t sure if I wanted her to be just a sketch that I would later charcoal, paint, or collage at a later time. What I did know was that at some point she would turn into a dashboard for my Traveler’s Notebook (TN). Not being able to work for any longer than 2 hours at any one time yet, I knew whatever I did would have to be short and quick. So … collaging and painting her seemed like my best option. Materials List: 130gsm paper, torn papers for background, stencils (I used snowflake stencils), gesso, gel medium, 3 complimentary acrylic paints for background, white paint, paint for flesh tone, paint for blush, paint for hair, your choice of stamps and stamp pads, pen for doodling. First draw your limiting factors (or “size”) your girl / art will need contained in. Then draw your sketch of your winter girl into the space. Place torn papers onto the “background” of your sketch. Adhere with gel medium. Add stamps randomly onto the “background” of the sketch. Use your pen to write words of your choice randomly onto the “background” of your sketch. Seal everything with gel medium. Begin covering your background with your chosen paints in layers. Be careful not to be too heavy handed. If your “face” begins to get lost, use your pen to darken all the lines. Begin to paint your face. Do your flesh tone first, followed by cheek, eye, nose, and lips. Be sure to add shading and highlights. When you are satisfied with your face move onto your hair. Be sure to add highlights and lowlights into the hair. I brightened up my page by adding some smaller white snowflakes all over the page, including in her hair and on top of the finished background. I finished the piece by adding some stamps, writing a few words, and adding some additional shading. This is the last post for our WIP Wednesday posts this year. Many of you have chimed in saying how much you really enjoy this series, so for 2017, the WIP Wednesday series will be back. To those of you who left comments, I am so thankful that you took time out of your day to do so. Thank you so very much. I’ll see you for our next WIP Wednesday in 2017. Cheers! What’s going on in your studio? What are you working on? Is there a project you’d like to see me tackle and feature on the blog? Let me know in the comments below. I’d love to hear your thoughts & ideas! I enjoy all of your posts, I would like to see more of the mixed media. My first love was painting and now I enjoy mixed media with polymer clay as my primary medium. With the help of you and Christe Friesen project my family got to enjoy a piece of the clay projects that I’ve been doing for the past year, they enjoyed it very much. I have enjoyed learning new techniques from both you andChristie and hope to continue throughout the 2017. Hi Charlotte – Thanks for chiming in. I love mixed media. I haven’t found a way to successfully combine my mixed media with my whimsical sculpting that “resonates” with my soul yet (which is why you haven’t seen much in that way) except collage. So … we’ll see what happens in the future. This year I’m working on just “playing” more and seeing what happens. I’m so glad you enjoyed the Friesen project so much. It was a big hit. I’m so glad your family loved seeing what you made too. Keep at it. Claying is so much fun!